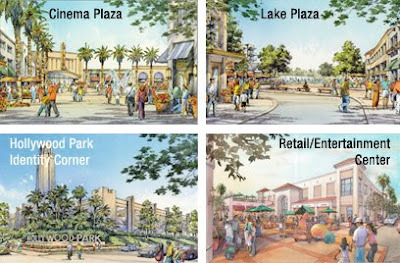 Plans to transform Hollywood Park into a mixed-use community featuring retail stores, theaters, parks, homes, and a new elementary school are underway. This 238-acre site is planned for the Northeast corner of Century Blvd and Prarie Ave. The residential neighborhoods will include single-family homes, townhomes, and condos. This community effort will greatly benefit the city of Inglewood. 19,000 construction and permanent jobs will be created, and annual tax revenue to Inglewood will support services like police and fire protection, libraries, parks, and other programs. If you are interested in being involved with this project, call (310) 382-9029 or click the title link for the website. That's whussup! Hopefully my condo goes up in value.